"A very easy '1, 2, 3' recipe you can whip together in no time with no baking. My grandma taught me how to make this, it is very enjoyable after a spicy dinner, on a hot day, or for those who love a tart and tangy dessert. You can add whipped cream if you like, or even beat sugar into the whites from the above mentioned eggs to make meringue." Beat condensed milk and egg yolks in a bowl until smooth. Add lemon juice and stir until the mixture begins to thicken; pour into prepared pie crust. Refrigerate pie until set in the middle, 6 hours to overnight. my mil has been making this recipe forever.. easy,yummy and one of my hunnys favorite! 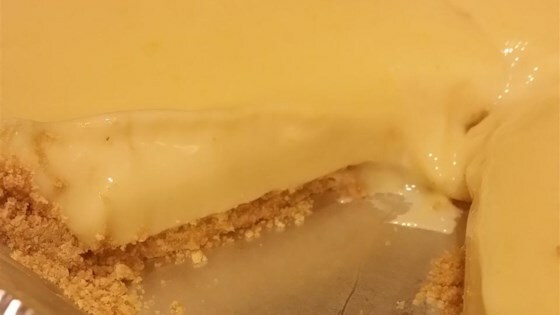 only thing I did was double the recipe so it filled my graham cracker crust. This was a very easy recipe and very good. Reminded me of my mom's but she used vanilla wafers as a crust. Awesome and so easy! I didn’t change or add anything!